LONDON--(BUSINESS WIRE)--Technavio market research analysts forecast the corporate online language learning market in the US to grow at a CAGR of more than 16% during the forecast period, according to their latest report. The market study covers the present scenario and growth prospects of the corporate online language learning market in the US for 2017-2021. The report also lists online language learning programs and online language learning apps as the two main product segments, of which the online language learning programs segment accounted for close to 59% of the market share in 2016. “The US holds various strategic, economic, and business relationships with many countries, such as countries in APAC and Europe, which results in diversified business communications. As a result, it is essential for companies in the US to invest in vital soft skills and language training programs to ensure efficiency of business activities,” says Jhansi Mary, a lead analyst at Technavio for education technology research. Analytics-embedded foreign language learning programs are increasingly available for academic and non-academic learners. Analytics is a powerful tool for vendors as it can collect information pertaining to various aspects of learner interaction with the program. The online language learning methodology results in the creation of several trails, which are captured by these analytical tools. With the help of relevant granular information, vendors are applying adaptive learning and creating specific content that aligns with the learner's requirements. The prevailing levels of competition among language learning service providers have compelled them to incorporate technologies through which they can gain a competitive advantage and remain abreast of the market changes. The analytical applications embedded in language learning programs are thus, helping to boost the overall growth of the market. Organizations in the US are rapidly embracing emerging technologies to facilitate workplace activities. Cloud computing has been accepted as a better alternative to on-premise and traditional modes of procuring solutions due to numerous advantages, such as scalability, cost reduction, and mobility. Using the cloud platform for delivering training, be it technical or non-technical training, such as language learning, is gaining traction among organizations. For instance, FluentFlix serves organizations in varied industries through its cloud-based language learning products and services. “The popularity of cloud-based m-learning is propelling the demand for online language learning programs in the US. Cloud-based language learning content is automatically updated, and there is no need of purchasing the latest editions of training materials. This facility helps organizations in hassle-free use and maintenance of language learning programs,” says Jhansi. Language learning programs are being offered at workplaces to drive the strategic expansion of organizations in various geographies. Moreover, studies reveal that language learning programs are also an effective means to engage employees and strengthen leadership while triggering their learning and development. Attaining proficiency in languages other than the native language acts as an addition of a new skill. Hence, it helps in their personal development. Prioritized employee engagement activities yield positive impacts on the employee morale, retention, loyalty, and productivity. Consequently, this produces a conducive environment for organizations to achieve their business goals and profitability. Hence, on this account, language learning programs are witnessing high demand in the corporate sector in the US. 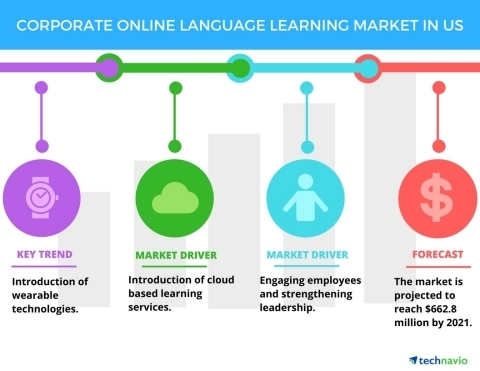 Technavio market research analysts forecast the corporate online language learning market in the US to grow at a CAGR of over 16% through 2021.